"Michael was embodiment of music." "He was music. He embodied the music." "Music is a mantra that soothes the soul..., something our body has to have. It´s important to understand the power of music." "People ask me how I make music. I tell them I just step into it. It’s like stepping into a river and joining the flow. Every moment in the river has its song. So I stay in the moment and listen. What I hear is never the same. A walk through the woods brings a light, crackling song: Leaves rustle in the wind, birds chatter and squirrels scold, twigs crunch underfoot and the beat of my heart holds it all together. When you join the flow, the music is inside and outside, and both are the same. As long as I can listen to the moment, I’ll always have music." "The songwriting process is something very difficult to explain, because it's very spiritual. It's, uh...You really have it in the hands of God, and it's as if its been written already - that's the real truth. As if its been written in its entirety before were born and you're just really the source through which the song come. Really. Because there is...they just fall right into your lap in it's entirety. You don't have to do much thinking about it. And I feel guilty having to put my name, sometimes, on the songs that I - I do write them - I compose them, I write them, I do the scoring, I do the lyrics, I do the melodies but still, it's a...it's a work of God." "One morning MJ came in with a new song he had written overnight. We called in a guitar player, and Michael sang every note of every chord to him. “here’s the first chord first note, second note, third note. Here’s the second chord first note, second note, third note”, etc., etc. We then witnessed him giving the most heartfelt and profound vocal performance, live in the control room through an SM57. He would sing us an entire string arrangement, every part. Steve Porcaro once told me he witnessed MJ doing that with the string section in the room. Had it all in his head, harmony and everything. Not just little eight bar loop ideas. he would actually sing the entire arrangement into a micro-cassette recorder complete with stops and fills. His beatboxing was without parallel, and his time was ridiculous. His sense of harmony was incredible. Never a bad note, no tuning, even his breathing was perfectly in time." "I love to write songs. It´s one of my favourite things to do. It´s very spiritual. It´s a connection. I´m just a source through which it comes. I´m inspired by a lot of things but it´s done in the heavens. I listen to the music and I just create from there." 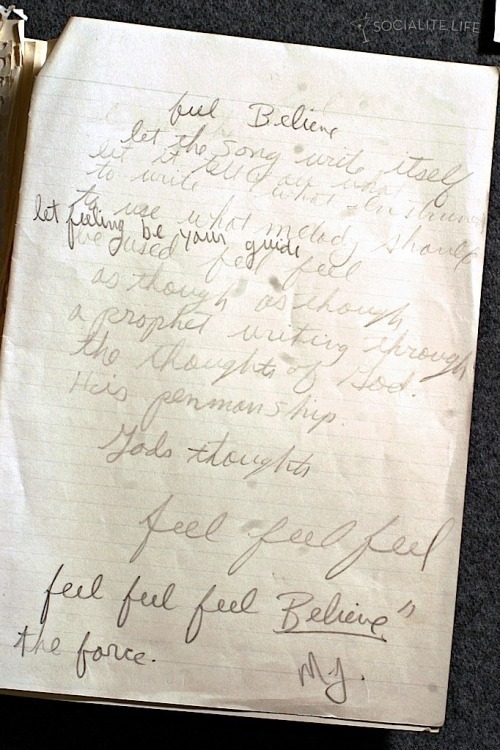 "I wrote ‘Will You Be There’ at my house, Neverland in California… I didn’t think about it hard. That’s why it’s hard to take credit for the songs that I write, because I just always feel that it’s done from above. I feel fortunate for being that instrument through which music flows. I’m just the source through which it comes. I can’t take credit for it because it’s God’s work. He’s just using me as the messenger…"
Michael Jackson: "Well, the best songs that are written write themselves. You don't ask for them, they just drop into your lap. Then there are those songs that, you know, you kind of uh, incubate. You know, you plant the seed, let the subconscious take its course, and within time you hope something comes, and most the time it does. I don't believe in the concept of writer's block -- that is a bad word. You create it when you say it. There's no such thing. Um, like any painter or sculptor, they paint... they do their best work when they're in the 60s and their 70s. Fred Astaire did his best dancing when he was in his 70s. Angelo [Michelangelo] sculpted late into his 60s and 70s, doing brilliant ingenious work. But in the music business some of these great artists have become stumped because they self-abuse themselves at a young age, with all these crazy things they drink and pills and things, and uh, that's just not good -- just not a good thing. I hate to say that to hurt anybody, but we should take care of our bodies a little more. "We would work on a track and then we’d meet at his house, play what we worked on, and he would say, ‘Smelly, let it talk to you.’ I’d go, ‘OK.’ He’d say, ‘If the song needs something, it’ll tell you. Let it talk to you.’ I’ve learned to do that. The key to being a wonderful writer is not to write. You just get out of the way. Leave room for God to walk in the room. And when I write something that I know is right, I get on my knees and say thank you. Thank you, Jehovah!" Question: How do you channel your creativity? Michael: I don’t force it, I let nature take its course. I don’t sit at the piano and think, I’m going to write the greatest song of all time. It doesn’t happen. It has to be given to you. I believe it’s already up there before you are born, and then it drops right into your lap. It’s the most spiritual thing in the world. When it comes, it comes with all the accompaniments, the strings, the bass, the drums, the lyrics, and you’re just the medium through which it comes, the channel. Sometimes I feel guilty putting my name on songs — written by Michael Jackson — because it’s as if the heavens have done it already. Like Michelangelo would have this huge piece of marble from the quaries of Italy, and he’d say, “Inside is a sleeping form.” He takes a hammer and chisel, and he’s just freeing it. It’s already in there. It’s already there. "Once he went on his knees and started playing piano in the barn. He played a few notes then began singing. It was a love song and sounded really good and he had actually written it right there in front of me. It was amazing to watch, it took him about 6 minutes. When he got up I said did you just write that? He said ´yeah, but I have forgotten it already´. Then he started looking for something else to do. No matter what his problems are, the man is a complete genius." Deep inside I feel that this world we live in is really a big, huge, monumental symphonic orchestra. I believe that in its primordial form all of creation is sound and that it’s not just random sound, that it’s music. You’ve heard the expression, music of the spheres? Well, that’s a very literal phrase. In the Gospels, we read, “And the Lord God made man from the dust of the earth and breathed into his nostrils the breath of life and man became a living soul.” That ‘breath of life’ to me is the music of life and it permeates every fiber of creation. In one of the pieces of the ‘Dangerous’ album, I say: “Life songs of ages, throbbing in my blood, have danced the rhythm of the tide and flood.” This is a very literal statement, because the same new miracle intervals and biological rhythms that sound out the architecture of my DNA also governs the movement of the stars. The same music governs the rhythm of the seasons, the pulse of our heartbeats, the migration of birds, the ebb and flow of ocean tides, the cycles of growth, evolution and dissolution. It’s music, it’s rhythm. And my goal in life is to give to the world what I was lucky to receive: the ecstasy of divine union through my music and my dance. It’s like, my purpose, it’s what I’m here for." "I think music soothes the savage beast. If you put cells under a microscope and you put music on, you’ll see them move and start to dance. It affects the soul… I hear music in everything." "Once the music plays, it creates me. The instruments move me, they control me. Sometimes I´m uncontrollable and it just happens. Boom, boom, boom - once it gets inside of you." „My uncle was always big on teaching my cousins and me about song structure. He would like to break down songs -- he would always start with the base line, and then start humming a melody. He wanted to teach me how things came together, how to portray my voice and where music came from. Question: ‘Invincible’ was several years in the making. Does your perfectionism slow the process? Michael: It did take a while because I’m never happy with the songs. I’ll write a bunch of songs, throw them out, write some more. People say, “Are you crazy? That’s got to go on the album.” But I’ll say, “Is it better than this other one?” You only get 75 minutes on a CD, and we push it to the limit. Question: Did you approach ‘Invincible’ with a single theme in mind? Michael: I never think about themes. I let the music create itself. I like it to be a potpourri of all kinds of sounds, all kinds of colors, something for everybody, from the farmer in Ireland to the lady who scrubs toilets in Harlem. Question: Has it become easier to write songs over time? Michael: It’s the most effortless thing in the world because you don’t do anything. I hate to say it like that, but it’s the truth. The heavens drop it right into your lap, in its totality. The real gems come that way. You can sit at the piano and say, “OK, I’m going to write the greatest song ever written,” and nothing. But you can be walking down the street or showering or playing and, boom, it hits you in the head. I’ve written so many like that. I’m playing a pinball machine, and I have to run upstairs and get my little tape recorder and start dictating. I hear everything in its totality, what the strings are going to do, what the bass is going to do, the harpsichord, everything. Question: Is it difficult translating that sound to tape? Michael: That’s what’s frustrating. In my head, it’s completed, but I have to transplant that to tape. It’s like [Alfred] Hitchcock said, “The movie’s finished.” But he still has to start directing it. The song is the same. You see it in its entirety and then you execute it. "I always want to do music that inspires or influences another generation. You want what you create to live, be it sculpture or painting or music. Like Michelangelo, he said, ´I know the creator will go, but his work survives. That is why to escape death, I attempt to bind my soul to my work.’ And that’s how I feel. I give my all to my work. I want it to just live." "There is no question that Michael Jackson is one of the greatest talents the world has ever known. That when he sang a song at the ripe old age of eight he could make you feel like an experienced adult was squeezing your heart with his words. That when he moved he had the elegance of Fred Astaire and packed the punch of Muhammad Ali. That his music had an extra layer of inexplicable magic that didn’t just make you want to dance but actually made you believe you could fly, dare to dream, be anything that you wanted to be.(...)" "In early 1985 we cut "We Are the World" at an all-night all-star recording session that was held after the ceremony for the American Music Awards. I wrote the song with Lionel Richie after seeing the appalling news footage of starving people in Ethiopia and Sudan. Around that time, I used to ask my sister Janet to follow me into a room with interesting acoustics, like a closet of the bathroom, and I'd sing to her, just a note, a rhythm of a note. It wouldn't be a lyric or anything; I'd just hum from the bottom of my throat. I'd say, "Janet, what do you see? What do you see when you hear this sound?" And this time she said, "Dying children in Africa." "You're right. That's what I was dictating from my soul." And she said, "You're talking about Africa. You're talking about dying children." That's where "We Are the World" came from. We'd go in a dark room and I'd sing notes to her. To my mind, that's what singers should be able to do. We should be able to perform and be effective, even if it's in a dark room. We've lost a lot because of TV. You should be able to move people without all that advanced technology, without pictures, using only sound. I've been performing for as long as I can remember. I know a lot of secrets, a lot of things like that. I think that "We Are the World" is a very spiritual song, but spiritual in a special sense. I was proud to be a part of that song and to be one of the musicians there that night. We were united by our desire to make a difference. It made the world a better place for us and it made a difference to the starving people we wanted to help." "It [my music] breaks all barriers. I don't have to make a political statement. I do all of that with music." "I love great music — it has no color, it has no boundaries." "Great music and great melodies are immortal. Fashions change, culture changes, customs change. Great music is immortal. We still listen to Mozart, Tchaikovsky and Rachmaninoff. Any of them. Great music is like a great piece of sculpture of a great painting. It's forever. For generations upon generations to appreciate forever." Question: "What's changed about the music industry or about, you know, the music that's out there. What do you think is different?" Michael Jackson: " Well, I think.. Ah, I don't think people thought the Rap music would last as long as it has. And it has gone through evolutional stages -- there's more melody in it now, it's more acceptable, because melody will never die. Will never die. And the rhythm-- things are a little more rhythmic now. Because people want to dance. It's part of the human condition; it's part of our biological makeup. Our cells dance when we hear beats. You notice a.. a one year old child will start moving hearing music. How do they know to move? 'Cause it's biological. It's not just hearing of the ear, it's feeling, you know. And playing music, the grass and the trees and the flowers... They're all influenced by music. They become more beautiful and more vibrant in how they grow. Music is a very important and powerful substance, and all the planets in the universe make music. It's called music of the spheres. They all make a different note; they make harmony. So there's harmony even in the universe as we speak." "Music has been my outlet, my gift to all of the lovers in this world. Through it — my music, I know I will live forever." "I always wanted to do music that influences and inspires each generation. Lets face it, who wants mortality?" "When you want to be close to me, listen to the music. The love is stored there and will not die!" Q: Would you tell us when you started composing music? MJ: Probably since the age of seven. Q: Would you tell us, how old you were when you had your first song published? MJ: That I wrote myself? Q: Could you tell us approximately Mr. Jackson, how many songs you’ve written to date? Q: And approximately, how many of those songs had been released to the public? MICHAEL JACKSON: So, I’m interviewing you, right? And I think it’s seven questions, or something like that? PHARRELL WILLIAMS: Sure. Whatever you like. JACKSON: Okay. What would you say inspires you in your music? What is it that inspires you to create your music? JACKSON: No. No, that’s a perfect analogy. JACKSON: Yeah. And it refuses to let you sleep until it’s finished. JACKSON: Yeah, I go through the same thing. [laughs] And what do you think of the music today—are you into the new sounds that are being created and the direction that music is going? WILLIAMS: Well, personally, I kind of feel like I’m taking notes from people like yourself and Stevie [Wonder] and Donny [Hathaway], and just sort of doing what feels right. WILLIAMS: You know, like when everyone was going one way, you went Off the Wall. WILLIAMS: And when everyone else was going another way, you went Thriller. You just did it your way. And I’m taking notes from people like yourself, like not being afraid to listen to your feelings and turn your aspirations and ambitions into material. Making it happen, making it materialize . . .
JACKSON: Who are some of the older artists—not the artists on the radio today—who inspired you when you were younger? Like the artists your father listened to, did you learn anything from those artists? WILLIAMS: Absolutely. The Isley Brothers. JACKSON: Yeah, me too. I love the Isley Brothers. And I love Sly and the Family Stone. WILLIAMS: Those chord changes. They take you away. Everything in the cosmos is energy and vibrates in certain frequencies. So is sound and therefore music. Everything that exists is made from 9 notes. As music plays a major role in our lives, in this section is presented the highest vibrational music the world has ever known - it´s called Solfeggio frequencies. When I was just starting out, my first producer used to make me listen to Michael Jackson’s live performance of “Who’s Loving You.” He would have me watch that for hours back to back to back. Michael Jackson changed me, and helped me to become the artist I am thank you Michael. "Music wouldn't be what it is without someone like Michael Jackson. I remember going to my high school talent show singing 'The Way You Make Me Feel' and being a huge fan of his album Bad. I know all my dancers wouldn't be behind me dancing if it weren't for that." "More than any musician in history, his god given gifts were revealed in ways that reached into our souls with a gloved hand, touching the very core of everything that is humanity. Although the "music world" will forever mourn his passing and suffer the loss of his innate creativity, Michael Jackson - the man and his music are forever "Eternal". "I am speechless about the idea of putting music fans in jail for downloading music. It is wrong to illegally download, but the answer cannot be jail. Here in America we create new opportunities out of adversity, not punitive laws, and we should look to new technologies like Apple's new Music Store for solutions. This way, innovation continues to be the hallmark of America. It is the fans that drive the success of the music business."